Small pinwheel type ion motors fall into the category of a fun science experiment or something neat to do with high voltage, but Hackaday’s own [Manuel Rodriguez-Achach] added a neat twist that incorporates neon lamps. Normally you’d take a straight wire and make 90 degree bends at either end but pointing in opposite directions, balance it on a pole, and apply a high voltage with a moderate amount of current. The wire starts spinning around at the top of the pole, provided the ends of the wire are sharp enough or the wire has a small enough diameter. If your power supply has ample current available then in the dark you’ll even see a purplish glow, called a corona, at the tips of the wire. [Manuel] made just such an ion motor but his power supply didn’t have the necessary current to produce a strong enough corona to be visible to his camera. So he very cleverly soldered neon lamps on the two ends of the wires. One leg of each lamp goes to the wire and the other end of the lamp acts as the sharp point left out in the air for emitting the ions. The voltage needed across each lamp in order to ignite it is that between the high voltage power supply’s output and the potential of the surrounding air. That air may be initially at ground potential but he also bends the other output terminal of the power supply such that its tip is also up in the air. This way it sprays ions of the opposite polarity into the surrounding air. Either way, the neon lamps light up and the wire spins around on the pole. Now, even without a visible corona, his ion motor makes an awesome display. Check it out in the video below. For more about these ion motors, sometimes called electric whirls, check our article about all sorts of interesting non-electromagnetic motors. If you’re not familiar with sputtering, that’s understandable. In this context, sputtering is a process that transfers particles from one solid to another by bombarding the first solid with some sort of energetic particles, usually electrons or a plasma. When properly controlled, sputtering has applications from mass spectrometry to the semiconductor industry, where it’s used to either deposit thin films on silicon wafers or etch them away selectively. No matter the application, sputtering needs a stable stream of plasma. [Nixie] has posted a series of articles on his blog walking us through his plasma experiments, from pulling a really strong vacuum to building a high-voltage power supply from a microwave oven transformer. It’s a project that needs a deep well of skills and tools, like glassworking, machining, and high-voltage electronics. Check out the plasma in the video below. Will [Nixie] be using this for a DIY fab lab? Will it be used to make homebrew LEDs? The world waits to hear. The Engineering and Physical Sciences Research Council awarded a remarkable photograph its overall prize in science photography. The subject of the photograph? 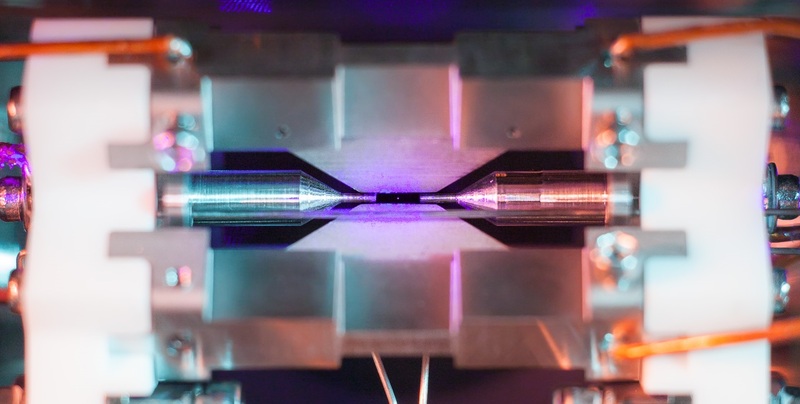 A single atom visible to the naked eye. Well, perhaps not exactly the naked eye, but without a microscope. In the picture above (click here to enlarge), the atom is that pale blue dot between the two needle-like structures. You probably learned in school that you couldn’t see a single atom, and that’s usually true. But [David Nadlinger] from the University of Oxford, trapped a positively charged strontium atom in an ion trap and then irradiated it with a blue-violet laser. The atom absorbs and reemits the light, and a camera can pick up the light, creating a one-of-a-kind photograph. The camera was a Canon 5D Mk II with a 50mm f/1.8 lens — a nice camera, but nothing too exotic. 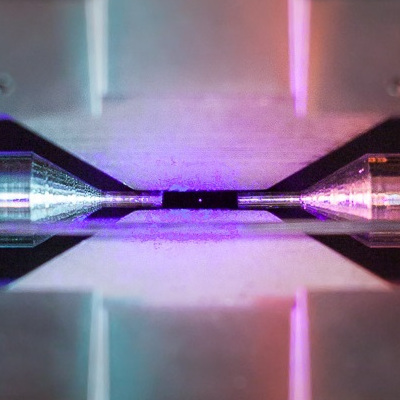 The ion trap keeps the single atom balanced between two small needle points about 2 millimeters apart. [Nadlinger] did some math that convinced him the photograph could be possible and made it a reality on a Sunday afternoon. The pale dot isn’t especially spectacular by itself, but when you realize that it is the visual effect of a single atom, it is mind-blowing. Turns out, the lab has taken some similar photographs in the past. They don’t remember who took it, but they have a picture of 9 calcium-43 ions trapped, that you can seen below. The ions are 10 microns apart and at an effective temperature of 0.001 degrees Kelvin. Other winning photographs included patterns on a soap bubble, an EEG headset in use, and microbubbles used to deliver drugs. There’s also an underwater robot, a machine for molecular beam epitaxy that looks like a James Bond villain’s torture device, and lattices made with selective laser melting 3D printing. If you want to look at atoms from the comfort of your own home, maybe you should build an STM. You might even try NIST’s improved atom probe while you are at it. Just remember you can’t trust atoms. They make up everything. It’s 2100 AD, and hackers and normals live together in mile-long habitats in the Earth-Moon system. The habitat is spun up so that the gravity inside is that of Earth, and for exercise, the normals cycle around on bike paths. But the hackers do their cycling outside, in the vacuum of space. How so? With ion thrusters, rocketing out xenon gas as the propellant. And the source of power? Ultimately that’s the hackers’ legs, pedaling away at a drive system that turns two large Wimshurst machines. Those Wimshurst machines then produce the high voltage needed for the thruster’s ionization as well as the charge flow. They’re also what gives the space bike it’s distinctly bicycle-like appearance. And based on the calculations below, this may someday work! When you think of amplifiers, you’re probably thinking of audio or some big ‘ol power amps for radios. While interesting, there are some very interesting ‘alternative’ amplifiers floating around hackaday.io that are more than just power amps, and exceedingly useful, to boot. [Ronald] bought an XMS amplifier a few years ago, and although it worked well, every time he changed the input, the loudness had to be toggled. One thing led to another, and he realized this amplifier had a four-channel audio processor that could be controlled by I2C. This was the beginning of his Network Amplifier. Inside the box is a Raspberry Pi that controls a PT2314-based amplifier. Also included is a 2×16 character LCD, a few LEDs, switches, and a rotary encoder. 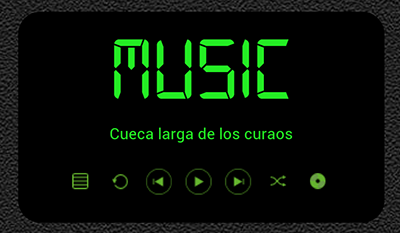 There was an Android app that controlled the amplifier, but this was discarded for a better looking web-based solution. Now [Ronald] has every audio source available over WiFi. What if you want an audio amplifier without a speaker? Wait, what? That’s what [DeepSOIC] is doing with his experiments in ion wind loudspeakers. ‘Ion wind lifters’ have been around for decades now, mostly in the labs of slightly off-kilter people who believe this is the technology aliens are using to visit earth. Nevertheless, ion wind lifters produce an airflow, and if you make that wind variable, you get sound. Pretty cool, huh? The amplifier for this project uses a tube to modulate kilovolt supply through the ion ‘blower’. Does it work? Sure does. [DeepSOIC] got a piece of 0.2 mm nichrome wire to discharge ions into the air, after which the ions drift into the second electrode. The result is sound, and the entire project is built deadbug style. It really doesn’t get cooler than this. 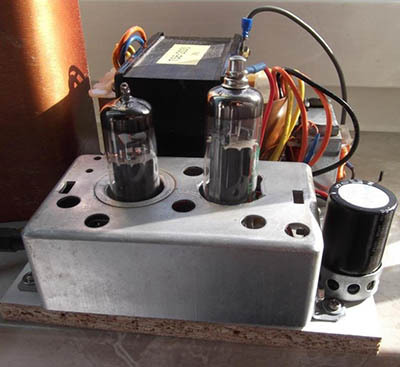 Continuing with the tube amp trend, [Marcel] built the cheapest little tube amp around. The design of an audio tube amp is fairly simple business. First, you start with a big ‘ol transformer, and rectify the AC into DC. This gets fed into a preamp tube, and this is fed into a bigger power tube. In about 50 years of development, tube designers had the technology down pat by the mid 1950s, and triode/pentode tubes were created. This allowed tube designers to condense two amplifier stages into a single tube. While this setup was usually used for cheap, toy-like electronics, you can still buy the ECL82 tube today. [Marcel] took one of these tubes, added a rectifier tube, transformer, and big cap to create the simplest possible tube amp. Use it for guitars, use it for hi-fis, it’s all the same. It’s not going to sound great, but it is a very easy amp to build. 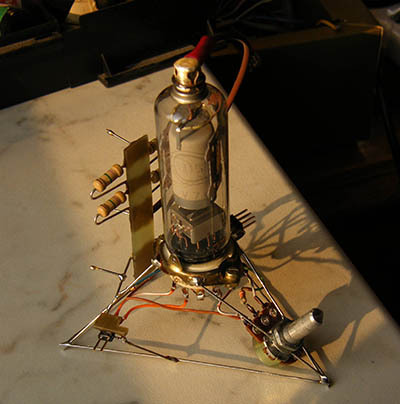 All of these interesting audio amplifier projects are curated on this new list! If you have a build that amplifies sound in an interesting way, don’t be shy, just drop [Adam] a message on Hackaday.io and he’ll add it. That’s it for this week’s Hacklet. As always, see you next week. Same hack time, same hack channel, bringing you the best of Hackaday.io!